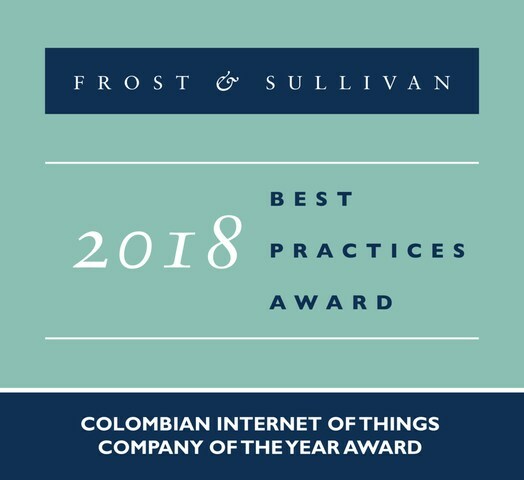 SÃƒO PAULO, Nov. 5, 2018 /PRNewswire/ -- Based on its recent analysis of the Colombian Internet of Things (IoT) market, Frost & Sullivan recognizes TelefÃ³nica Movistar Colombia with the 2018 Colombian Company of the Year Award for successfully positioning itself as a business transformation enabler. Digital transformation brings with it a unique set of challenges, and TelefÃ³nica Movistar believes organizations' focus will shift away from hardware and connectivity toward technologies that support business transformation goals. As such, TelefÃ³nica Movistar redrew its roadmap by adding specialized digital service business units to each of its departments, with one of them specifically for IoT. "ICT spending is still dominated by traditional products, such as on-premise hardware and software, and ICT providers are required to cater to legacy IT infrastructure, even though this segment is unlikely to see much growth," said Gina SÃ¡nchez, Digital Transformation Senior Consultant. "In response to this situation, TelefÃ³nica Movistar offers a consultancy-type purchasing experience that extracts the most value from legacy investments, while working with customers to build a digital services roadmap that includes IoT. This way, TelefÃ³nica Movistar addresses the immediate need for solutions that stitch together physical, digital, and legacy systems as organizations push ahead with their digital transformation efforts." TelefÃ³nica Movistar aims to help clients strengthen their value propositions, rather than only facilitate transactions. For instance, through its Smart Retail solution, the company delivers technology platforms, audio-visual content, and related services that improve customer interactions at the point of sale. Along with its smart retail platform, TelefÃ³nica Movistar helps retail companies transform and adjust to the needs of their increasingly digital customers. The platform collects customer data in real time, thus enabling the management of audio, video, and lighting of physical spaces or the integration of advertisements. On the strength of these outstanding features and functions, TelefÃ³nica Movistar registered a 55% rise in revenue for its digital unit, which includes Big Data analytics services, Advertising and IoT. TelefÃ³nica's IoT solutions are aimed at a wide range of verticals, including retail, agro, industry, logistics, energy, and smart cities, thus allowing the company to generate multiple revenue streams, rather than depend on the traditional machine-to-machine M2M portfolio of fleet tracking-related solutions. TelefÃ³nica Movistar ´s IoT service portfolio includes a self-management platform called Smart M2M, which enables customers to monitor every device connected through the IoT solution in real time. Additionally, the company launched an IoT in a Box solution for the Colombian market, consisting of a comprehensive, integrated solution that bundles leading-edge GPS devices, multicarrier connectivity, and comprehensive support. Moreover, TelefÃ³nica Movistar has formed partnerships with the most renowned global hardware vendors and provides hardware discounts as part of its IoT solution. "As a technology-agnostic connectivity provider, TelefÃ³nica Movistar has adopted an open platform approach to differentiate itself from its peers," noted SÃ¡nchez. "TelefÃ³nica Movistar ´s go-to-market approach is based on creating customized solutions for any market segment, which makes its IoT offerings highly price competitive and valuable to companies." Each year, Frost & Sullivan presents a Company of the Year award to the organization that demonstrates excellence in terms of growth strategy and implementation in its field. The award recognizes a high degree of innovation with products and technologies and the resulting leadership in terms of customer value and market penetration. TelefÃ³nica is one of the biggest drivers of the digital economy in the country, with revenues of 5.0 billion pesos in 2017. The activity of the company, which operates under the Movistar brand, is mainly focused on mobile telephony and connectivity, broadband services, home fiber optic, satellite television, fixed telephony and the offer of digital solutions for small, medium and large companies and corporations. TelefÃ³nica is present in 282 municipalities with fixed broadband, 957 with mobile telephony and in 341 it offers 4G LTE technology. Likewise, it offers fixed telephony in 767 municipalities. TelefÃ³nica ended the first half of 2018 with a customer base of 18,5 million: 15,1 million mobile lines, 1,2 million broadband customers, 564 thousand digital satellite TV and 1,6 million fixed lines in service. Frost & Sullivan, the Growth Partnership Company, collaborates with clients to leverage visionary innovation that addresses global challenges and related growth opportunities that will make or break today's market participants. For more than 50 years, Frost & Sullivan has been developing growth strategies for the global 1000, emerging businesses, the public sector, and the investment community. Contact us: Start the discussion.